There are some tales from motor racing’s past that appear to be works of pure fiction or myth, perhaps due to the passage of time and developments in the sport. Tales of Tazio Nuvolari blasting along Italian roads at over 200mph whilst coughing up blood as he neared his death, yet still managing to win the Mille Miglia could quite easily be the work of an author with a remarkable imagination. Or indeed, the tale of how Duncan Hamilton and Tony Rolt won the 1953 Le Mans 24 Hours: Details of the drama surrounding the victory have been denied by Rolt and a few others but fiction or just seemingly so, it makes for a remarkably entertaining story and one that, in the modern era, would be impossible to replicate. Duncan Hamilton lived a remarkable life and maintained that the ‘state’ himself and Tony Rolt found themselves in was nothing short of the truth, and you wouldn’t have argued with him; the Irishman was a larger-than-life character and known to be quite boisterous at times. Hamilton was also known to be quite liberal with the truth and would often exagerate tales of his heroics while in command of racing cars and the Lysanders he flew in World War II. He was no stranger to both speed and danger; a quality that Jaguar liked in their racing drivers. Heading to Le Mans in 1953 Ferrari were the hot favourites but Jaguar, with their revolutionary C-type – the first to use disc brakes – had been focusing their attention on the famous twice-around-the-clock race. It’s an undeniable fact that the Jaguar in which Hamilton and Rolt would be competing had been disqualified from even starting the race; not for a mechanical or driver infringement but for taking to the track during a practice session bearing the same car number as another competitor – something that would nowadays result in several embarrassed people losing their jobs and many, many press releases. Hamilton and Rolt accepted the disqualification and simply decided to treat the trip to France as a holiday – ‘to the bar then’. Drink followed drink followed drink and fairly soon the pair were rather worse for wear but unbeknown to them, Jaguar’s team manager – the superbly named ‘Lofty’ England – was fighting to get the Hamilton/Rolt Jaguar back on the grid. The respected and persuasive England succeeded; the Jag was in. There was of course one problem; it was by now 10am on race-day – with the start of the race just a few hours away – and both drivers were so consumed by alcohol it would have been foolish and damn near suicidal for either driver to take the wheel of a racing car. The show must go on however, and Jaguar needed to be at full force if they were to beat the red cars from Italy. Remarkably, Hamilton was strapped in to take the start of the biggest motor race in the world and to Jaguar, the most important. In an attempt to sober up the Irishman the team supplied coffee at every pit-stop; this, according to Hamilton, made his arms twitch uncontrollably and the only thing for it would be more alcohol – Brandy in fact – in order to fend off the looming hangover. The Brandy may have controlled the arm twitching and defended Hamilton from a world of room-spin and vomiting but it must have also helped when he struck a bird face first at 130mph and broke his nose. It is a wonder how the two drivers managed to drive at all but more wondrous still is that the pair won! 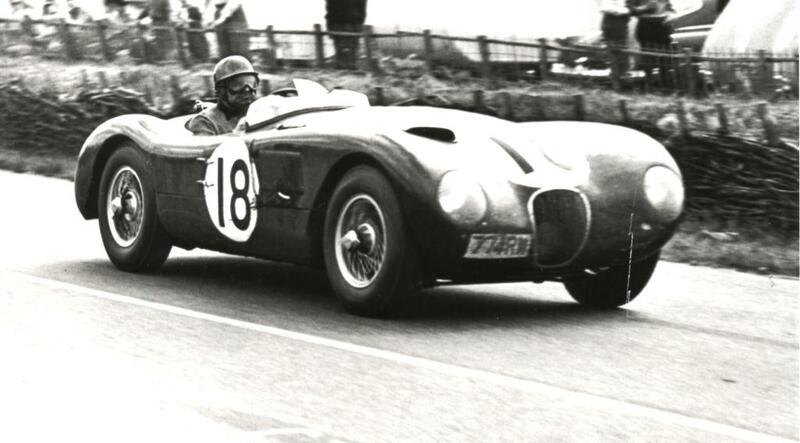 What’s more, the Hamilton/Rolt Jaguar had recorded the first 100mph average speed at Le Mans. Under the affects of being almost blind drunk and suffering from a broken nose, the Hamilton/Rolt Jaguar had won the Le Mans 24 Hours of 1953 at a record pace! There was only one way to celebrate; having stayed awake at the local bar through Friday night and racing through Saturday night, the pair continued in this vain by staying up all of Sunday night as well. Drinking, of course. Both ‘Lofty’ England and Tony Rolt have since denied that both drivers were drunk; England stating that “Of course I would never have let them race under the influence. I had enough trouble when they were sober!”. Drunk or not, it was a great victory and fiction or not, it’s a great story. However, for Duncan Hamilton, it didn’t really end there; the day after the Le Mans celebrations Hamilton drove to Portugal to prepare for the Grand Prix. After leading into the first corner of the race, he crashed heavily into an electricity pylon and had to be taken to hospital for an emergency operation. When Hamilton eventually came to he was in the operating theatre – in semi-darkness – and in the company of two nuns and a surgeon whose cigar was dangling precariously above his open chest cavity. ‘Why is it dark in here?’ Hamilton mumbled. ‘Because the pylon you crashed into fed this hospital’s electricity,’ replied the surgeon. All things considered – fighting in Word War II, racing cars whilst intoxicated and crashing into electricity pylons – it’s a wonder that Duncan Hamilton lived to the ripe old age of 74. While his racing career may not have been festooned with victories or high-profile moments of glory, it would appear that Hamilton could have had a career as a professional story-teller or perhaps a great author of fiction if it wasn’t for his passion for racing cars.